Banjo and Sonic in the Same Game? Sonic & Sega All-Stars Racing was already of interest to me, but now it’s a must-buy. Not only will the Xbox 360 version be the first true next-gen kart racer, but you can play as freaken’ Banjo and Kazooie. The video proves it. Last night, I finished one of the greatest games ever. Shenmue is a masterpiece. One minute you’re trying to find a cheap ticket to Hong Kong, and the next you’re fighting hundreds of gang members at once while only one man has your back. If you can stick it through to the third disc, things really start to pick up. All in all, it took me less than 20 hours of play time to finish Shenmue. Now I am ready to play the Xbox sequel, Shenmue 2. I hear that it too ends in a cliffhanger. It’s a shame because poor sales make a third game unlikely. However, I hear that there is hope of a PS3 re-release to enlighten viewers like you on the storyline, and to create interest in the series. Only time will tell if the rest of the planned 16 Shenmue chapters will be told. They’ve already done 5 of them. Edit: It seems that the arcade version of Michael Jackson’s Moonwalker was actually good. The Genesis version just happens to play completely differently. It’s a sad, sad day to be a Michael Jackson fan. However, it seems that in his death, we are better able to see his good side. Now is a good time to remember Thriller and the Moonwalk, but not this travesty. That’s right. 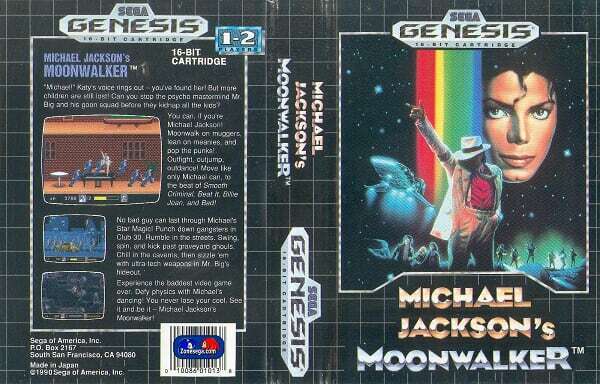 Michael Jackson had a video game for the Sega Genesis. I had a chance to play it at one time. Let me tell you that it sucked far more than Dracula. Everything from the jumping mechanics to the melee combat didn’t sit right, much like the Jackson’s rumored relations with children. Speaking of children, the goal of the game is to rescue such youthful organisms. Looking back at it, they were probably better off with the gang that kidnapped them. Although in the face of his death, writing typical Michael Jackson jokes like I just did feels somehow wrong. Maybe I’m just very sensitive, or maybe I’m on to something. Jackson didn’t live an easy life. From his father’s constant abuse to bombardment from the media, it isn’t easy being one of the best musicians in the history of American pop culture. I found this little gem with my colored pencils last week. It’s quite a strange piece of video game merchandise because of the random choice of color. Shouldn’t a Sonic pencil be blue and not yellow? Better yet, this pencil should have been plain old graphite with an eraser. That way, I could actually use it on a day to day basis. Oh well, enjoy some pics that I took with my Nintendo DSi camera.